Kaddish is the traditional mourner’s prayer, recited during the three daily prayers, as part of a minyan (a quorum of 10 men). It is often recited by a family member of the deceased, usually a sibling, parent, child or spouse. Kaddish is recited for the first 11 months after the death of a parent, and for 30 days in all other cases. After that, Kaddish is recited every year on the yahrzeit (Hebrew anniversary) of the departed. Once a person passes on to the next world, there’s nothing more we can do for them in a material sense. In the spiritual realm, though, our opportunity for giving is endless. And in the next world, everyone has the same taste in gifts. It’s the words of Torah learned in their memory that they appreciate, the meritorious deeds performed and the Kaddish recited on behalf of their neshamos (souls). The Kaddish prayer actually doesn’t mention the departed at all. It describes how exalted and praiseworthy God is, and demonstrates that we accept his judgement in taking the neshama of our loved one. The times that the Kaddish prayer are recited, during the first year and on the yearly anniversary of the death, are times when the soul experiences judgment. This public declaration of faith can actually raise the soul’s position in the heavenly spheres, bringing it closer to God, and a more meaningful eternity. While Kaddish is often recited by family members, many people appoint someone else to fulfill this obligation. If you’d like, Kupath Rabbi Meir will select a committed Torah scholar in Jerusalem to say Kaddish for you or your loved one every day for the entire first year, and then on the annual yahrzeit. Our kollel members will also undertake a daily learning regimen for the entire first year, upon your request. What’s the right way to commemorate a yahrzeit? The Hebrew date of the death is called the yahrzeit, and it has special significance for the soul of the departed. Each year, on that day, the soul’s position in the eternal world is reevaluated, and it has the opportunity to ascend to a higher level. That’s the reason for the custom to learn and pray in their memory. If you’d like, we can also arrange to have the minyan visit the kever on your behalf. If you’ve visited a Jewish cemetery, you may have noticed some matzeivos (headstones) studded with cream-colored invites. There’s a well-established custom to invite deceased relatives, especially parents and grandparents, to an upcoming wedding. One source for this custom is in the Zohar on Parshas Pinchas, where he explains that the neshamos actually attend the simchos of their descendants. If they’re going to be attending, it’s common courtesy to extend an invitation. If the kevarim are in Israel, and you wish you could invite your relatives, we’ll go for you. Just upload the invitation and information, and we’ll send a Torah scholar to deliver it and recite tehillim at the kevarim for a beautiful marriage. It’s the next best thing to a personal invitation, and still more personal than the postal system. We know that the location of an eternal resting place is one of the most important decisions of your life. You’re probably considering many different factors. As you may be aware, many people choose to be interred in the Land of Israel, because one of the basic tenets of Judaism is that at the resurrection of the previous generations at the coming of the Messiah. Others feel that although they were unable to live in the Holy Land, at the end that’s where they really want to be; in the holiest place on Earth. 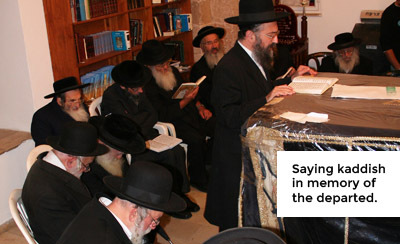 Kupath Rabbi Meir can facilitate the process. You’ll find our representatives straightforward and understanding, and equipped with all the information you need to make a decision.